Fort Kent was erected in the summer of 1839 as an American border outpost during the undeclared Aroostook War. The blockhouse, the first structure built in what is present-day city of Fort Kent, was named after then-governor of Maine Edward Kent. The Saint John River was a log driving route from upstream forests to downstream sawmills and paper mills until the Bangor and Aroostook Railroad and trucks began transporting pulpwood. After receiving nearly 200 inches (510 cm) of snow during the 2007–2008 winter season, the Saint John River began to flood on April 29. Nearly two days of nonstop rain also contributed to the flooding. As the river rose, it poured into the downtown area. More than 600 of Fort Kent's 4,233 residents were evacuated. The river's water level rose to nearly 31 feet (9.4 m), which was 6 feet (1.8 m) above flood stage. Governor John Baldacci declared a state of emergency for the region, flying from Augusta to see the damage first-hand. The Fish River did most of the damage, flooding St. Louis Catholic church and an apartment building. The town is economically and culturally linked to the Canadian towns of Clair and Saint-François-de-Madawaska, both in Madawaska County, New Brunswick, directly across the Saint John River. Most children on the Canadian side attend French-speaking school while their American counterparts are taught mainly in English. Sixty-two percent of the residents  of Fort Kent are habitual speakers of French. The variety of French spoken in Fort Kent and most of the Saint John River Valley closely resembles the French spoken in Quebec and New Brunswick. It is referred to as "Valley French" or "Brayon". Many residents have American-Canadian dual citizenship. According to the United States Census Bureau, the town has a total area of 55.15 square miles (142.84 km2), of which 54.17 square miles (140.30 km2) is land and 0.98 square miles (2.54 km2) is water. As of the census of 2010, there were 4,097 people, 1,747 households, and 1,062 families residing in the town. The population density was 75.6 inhabitants per square mile (29.2/km2). There were 1,922 housing units at an average density of 35.5 per square mile (13.7/km2). The racial makeup of the town was 94.9% White, 0.8% African American, 0.8% Native American, 0.7% Asian, 0.1% from other races, and 2.7% from two or more races. Hispanic or Latino of any race were 0.7% of the population. There were 1,747 households of which 25.8% had children under the age of 18 living with them, 49.5% were married couples living together, 8.0% had a female householder with no husband present, 3.4% had a male householder with no wife present, and 39.2% were non-families. 31.4% of all households were made up of individuals and 13.6% had someone living alone who was 65 years of age or older. The average household size was 2.23 and the average family size was 2.83. The median age in the town was 42.7 years. Of residents 19.9% were under the age of 18; 12.3% were between the ages of 18 and 24; 20.7% were from 25 to 44; 29.5% were from 45 to 64; and 17.6% were 65 years of age or older. The gender makeup of the town was 48.0% male and 52.0% female. As of the census of 2000, there were 4,233 people, 1,735 households, and 1,106 families residing in the town. The population density was 78.2 people per square mile (30.2/km²). There were 1,824 housing units at an average density of 33.7 per square mile (13.0/km²). The racial makeup of the town was 96.95% White, 0.38% Black or African American, 0.76% Native American, 0.87% Asian, 0.28% from other races, and 0.76% from two or more races. Hispanic or Latino of any race were 0.50% of the population. There were 1,735 households out of which 28.2% had children under the age of 18 living with them, 54.0% were married couples living together, 6.7% had a female householder with no husband present, and 36.2% were non-families. Of all households 29.3% were made up of individuals and 13.0% had someone living alone who was 65 years of age or older. The average household size was 2.34 and the average family size was 2.90. In the town, the population was spread out with 22.3% under the age of 18, 11.3% from 18 to 24, 26.9% from 25 to 44, 24.0% from 45 to 64, and 15.5% who were 65 years of age or older. The median age was 38 years. For every 100 females, there were 96.3 males. For every 100 females age 18 and over, there were 91.7 males. The median income for a household in the town was $29,547, and the median income for a family was $41,616. Males had a median income of $35,325 versus $19,146 for females. The per capita income for the town was $16,403. About 9.5% of families and 14.5% of the population were below the poverty line, including 13.7% of those under age 18 and 18.2% of those age 65 or over. Fort Kent is served by Maine School Administrative District 27. Schools in the town include Fort Kent Elementary School, Valley Rivers Middle School and Fort Kent Community High School. The town is home to the campus of the University of Maine at Fort Kent. Fort Kent signed a lease agreement with the Fish River Flying Club on July 8, 2011 to repair, maintain, and operate the local municipal airport, which had been closed since the 1980s. Fort Kent is home to the International Muskie Fishing Derby. The Derby was started in 2003 to provide a platform showcase the new fishery and continues today. It has brought attention to the new fishery and helped bring attention to national TV shows such as ESPN 2's Beat Charlie Moore. This show and other future shows will help show case the fishery to not only potential derby contestants but for a more secure and expanded tourist based fishery. The St John Watershed is a unique muskie habitat. Several factors make it acceptable and necessary to remove some fish from the ecosystem for the fishery to remain healthy. Along with the Muskie Derby is the Fort Kent Ploye Festival, one of the featured events is the making of the world's largest ploye. This event attracts hundreds of spectators, making it the highlight of the Ploye Festival. The massive ploye, which thus far, measures 12 feet in diameter, can only be accomplished with the help of friends and family of Bouchard Family Farm, producers or the ploye mix. It requires approximately fifteen bags of charcoal to ready the metal pan to the accurate temperature in order for the ploye to be cooked to perfection. It also needs about fifty pounds of ploye mix, lots of water (which is then mixed in five-gallon pails) and plenty of muscle for stirring the mix. Five people are required to transport the mix from the pails to the awaiting pre-heated pan and also four people to spread the mix out as fast as possible. The thin batter cooks quickly, so time is of the essence. Once cooked, the enormous pan is then removed from the coals, and the ploye is taken off with huge spatulas. Pieces of the giant ploye are then plopped onto large trays and brought to nearby tables where they can be buttered with brushes, and distributed to the eagerly awaiting crowd. The Fort Kent Outdoor Center (previously known as 10th Mountain) has hosted a multitude of World Cup biathlon events, including the largest events in 2004 and 2011, where racers from around the globe took part in various biathlon events in Fort Kent. During the 2011 World Cup Biathlon, Chicago Bulls superstar Scotty Pippen visited Fort Kent to witness the race. 2010–11 Biathlon World Cup – World Cup 8 The World Cup Biathlon will be returning to Northern Maine in 2016. Northern Maine and parts of New Brunswick and Quebec participated in the World Acadian Congress to celebrate the rich Acadians history of the area in 2014. Multiple family reunions and events took place during the time, including concerts, parades, and festivals. The Can-Am Crown International Sled Dog Race was first held on Tuesday, February 16, 1993. Nine teams from Maine, Ontario, Quebec, and New Brunswick competed in that race. In 1994 sixteen teams competed in the 250-mile race and eleven in the newly introduced 60-mile race. In 1997 a 30-mile race was added to the itinerary. That same year, the first Saturday in March was established as the official start date for all three races. The race begins on Main Street in Fort Kent, sloping underneath the international bridge to Canada, then extending into the western parts of the Allagash wilderness, and finishes back in Fort Kent. Three races are part of the CAN-AM Crown, consisting of a 30-mile, 60 mile, and an Iditarod Trail Sled Dog Race qualifying 250 mile race. ^ "CAN-AM CROWN INTERNATIONAL SLED DOG RACE". can-am.sjv.net. Archived from the original on April 16, 2010. Retrieved July 14, 2010. ^ "Fort Kent Chamber of Commerce". www.fortkentchamber.com. Retrieved January 19, 2011. ^ "Fort Kent Blockhouse". NPS-Maine Acadian Culture. U.S. National Park Service. Retrieved January 19, 2011. 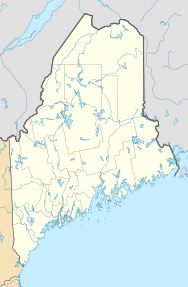 ^ "Maine - Aroostook County". National Register of Historical Places. Retrieved January 19, 2011. ^ United States Department of Transportation (1974). Rail Service in the Midwest and Northeast Region. United States Government Printing Office. ^ "A FLOOD FOR THE AGES". The Portland Press Herald / Maine Sunday Telegram. Maine Today Media. March 17, 2008. Archived from the original on July 28, 2011. Retrieved July 14, 2010. ^ "Fort Kent town, Aroostook County, Maine - DP-2. Profile of Selected Social Characteristics: 2000 (Total population)". factfinder.census.gov. Retrieved July 14, 2010. ^ "NowData - NOAA Online Weather Data". National Oceanic and Atmospheric Administration. Retrieved March 18, 2016. ^ "ME FT Kent". National Oceanic and Atmospheric Administration. Retrieved March 18, 2016. ^ "Recreational Aviation Foundation". theraf.org. ^ "Catch and Release". www.fortkent-muskie.com. ^ "Welcome to the Fort Kent Outdoor Center - Fort Kent Outdoor Center". Fort Kent Outdoor Center. ^ "Can-Am Crown Race Statistics". www.can-am-crown.net. ^ "Q&A Mike Daisey, Apr 15 2011 - Video - C-SPAN.org". C-SPAN.org. Wikivoyage has a travel guide for Fort Kent. This page was last edited on 1 April 2019, at 15:54 (UTC).